At Busworld Europe 2017, Tribus from the Netherlands presents two entirely electric minibuses. With these minibuses, the company provides in the great market demand for emission-free passenger transport. The first electric minibuses will be on the road soon. The first fully electric minibus is the e-Civitas. The vehicle is based on the Fiat Ducato L3H2 and has a front-wheel drive. The e-Civitas has a 70 kWh battery that can reach distances of up to 200 km! The floor of the e-Civitas is lowered, it has a fully automated sliding side door and a manually foldable platform and is wheelchair accessible. The new Civitas fits in everywhere with a maximum capacity of 8 passengers (8 seats or 7 seats and 1 wheelchair). Ideal for public transport and taxi, shuttle and airport shuttle services. A maximum of 19 kW per hour charge is possible via a Type2 plug for a loading time of about 3.5 hours. 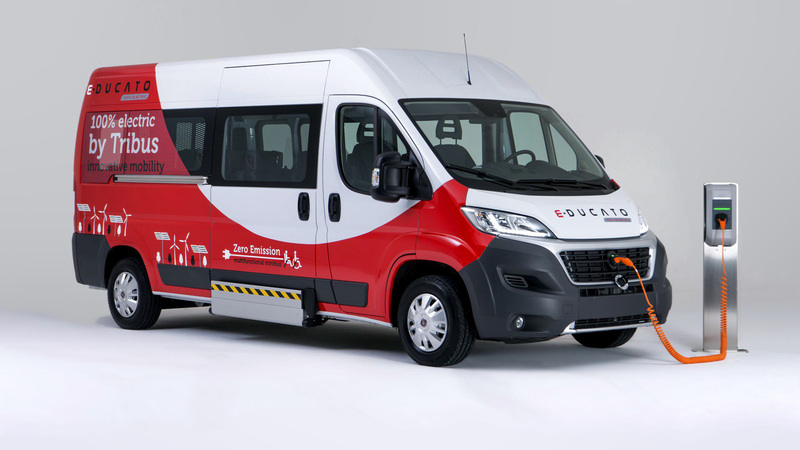 The second fully electric minibus is the so-called e-Ducato: a multifunctional minibus, for which Tribus is receiving a lot of interest already. This low-floor minibus is also based on the Fiat Ducato L3H2. The e-Ducato has the same electric drive as the e-Civitas: a 60 kW electric motor plus a 76 kWh battery. This ensures the e-Ducato has an action radius of over 220 km! This vehicle is available for test drives. The unique aspect of both minibuses is that the total weight stays below 3500 kg GVW. This means the vehicles can be driven with a B-class licence. You can find Tribus in Hall 9 at stand 922.